Our local Neighbourhood Policing Team hold monthly surgeries in Horndean. These have moved from Morrisons to Horndean Library and have been very successful. PCSO Rob Earl from our local team would like to invite you to come to the next one which will be on Friday 18th March between 4pm and 6pm at the Library on Five Heads Road. At the last surgery the team were able to give advice on parking issues as well as crime prevention. Over the last few years we have been working on the Local Plan for housing at EHDC. The first section – our objectively assessed need (How many new homes we need and where in the district they should go) – was reviewed and judged to be sound just about 14 months ago. This was when development interest was at its highest in East Hants. The second section – The Allocations Plan (the specific sites that should be picked including LEOH) – has in the last few weeks also been judged by the planning inspector to be sound. Over the last 12 months we have been able to use the early versions of this plan to refuse applications like Chalk Hill Road and Blendworth lane. We are now working on the third section which includes updating the gaps, SPB (Settlement Policy Boundary) and allocating sites for travellers in the district. The local plan needs to be reviewed every 5 years or so in a few years time we will need to show that we are on track to prevent developers taking opportunity locally. The very good news is that we were also able to convince the inspector that the 120 dwellings in the ‘Care Village’ could also be counted and this increases our buffer significantly. The Youth Awards are returning this year and the event hosted by The News has several categories below. If you know a young person who deserves recognition then please put them forward! A young person who has shown talent in drawing, painting or sculpture. This could also be a young person who is crafty and enjoys making things. This category also includes young people who excel at writing or have a literary gift. A young person who has always been there for a friend and stood by them in good times and bad. This is a young person who has gone the extra mile to bring happiness to someone, whatever their age. A young person with a physical or learning disability who has achieved success in their life. This could be a young person who has battled with their disability, but not let it hold them back. A young person/group who has collected tirelessly for a good cause or charity. This category also includes a young person/group who has used their own entrepreneurial initiative to start their own business or venture. A young person who has selflessly helped someone. This could be an act of bravery that shows courage well beyond their years. This category includes young people who have shown courage in difficult times. A young person who has inspired another person or group by their own actions or encouragement. This category could also be a young person who has overcome difficulties. A pupil or student who has excelled at school or college in a subject area. A young person or group of young people who can sing, play an instrument or write music. This could be a young person or group with a musical talent that should be recognised. Everyone nominated gets put forward. The News picks the winner. Every nominee is put forward for the public vote. The young person with the most votes is the winner. A young person or group of young people who shine on stage. This category includes any kind of stage performer, whether it be acting, dancing, magic or comedy. This can also include young people who work behind the stage. A young person/group who should be commended for their work in helping the environment. This could be helping to support an environment project, such as planting trees or community clean-ups. This could be a young person / group who has helped local wildlife or a young person / group who go that extra mile to help animals. Every year we have a grant fund to help local organisations and groups – and for the last few years I have supported Butser Home Start. This year I have helped to fund some of their great local work with another grant fund of £500.00 and here are some notes below about what they do and how you might be able to help if you like! Home-Start Butser, a local charity that provides desperately needed support to families with young children, needs people with big hearts, and a commitment to changing lives, to become our Community Ambassadors. From isolation, bereavement, multiple births, illness, disability to those simply finding parenting a struggle, we provide the care and respite that can change lives and give children the best start in life. Right now our volunteers are helping 70 families and more than 150 children, but requests for help are rising and without more funding we’ll have to turn them down. This is why we need you. As an Ambassador you will help raise awareness and funds of Home-Start services so we can support all the families and children who need us. Do you or your children attend local community or school groups? Are you a member of a church? Do you have strong links in your surrounding community? Do you simply have a passion for helping families in need in your community? If you answered yes to any of those questions we’d love you to consider becoming a Home-Start Butser Ambassador. By helping promote us in your communities, and networks, you will play a critical role in helping increase awareness of the vital work that we do, and help us raise much needed funds. Just a few hours a week circulating leaflets, or letting your friends and family know about our work, can make a huge difference. If you’re feeling more ambitious, you could give talks and presentations to groups and local schools to raise awareness, approach local businesses to hold collections tins, donate raffle prizes, or make us their chosen charity. You could even arrange your own fundraising event. Whatever you choose, your time and effort will make all the difference to families at a critical time in their lives. We will provide you with full training and materials, and you choose the hours to suit your lifestyle. Most work will be done from home, but occasional visits to our office in Petersfield may be necessary. All reasonable expenses will be reimbursed. Nicola Winter, our Scheme Manager, will fully support you, give advice, and be available to answer questions and discuss ideas with you. Please be aware that Police have received recent reports of counterfeit currency being passed as payment. £5, £20 and £50 notes so please check money you receive for selling items and change you get carefully. There are a number of preventative measures that retailers can take to ensure that notes are legitimate, eg UV lights and pens. If you have any concerns please contact 101. 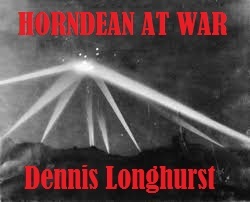 Over the last 8 months evidence of people living in the local landscape has come to light – It seems that Horndean has been home to small groups of people living in makeshift shelters and surviving off the land for millennia. This, unsurprisingly, is in areas very much outside of the Settlement Policy Boundary! The clues that have been found dating back to Mesolithic, Neolithic, Iron Age, Roman, Saxon and up to modern times and show a fascinating insight into how Horndean and the surrounding area was lived in a long long time before we came along! 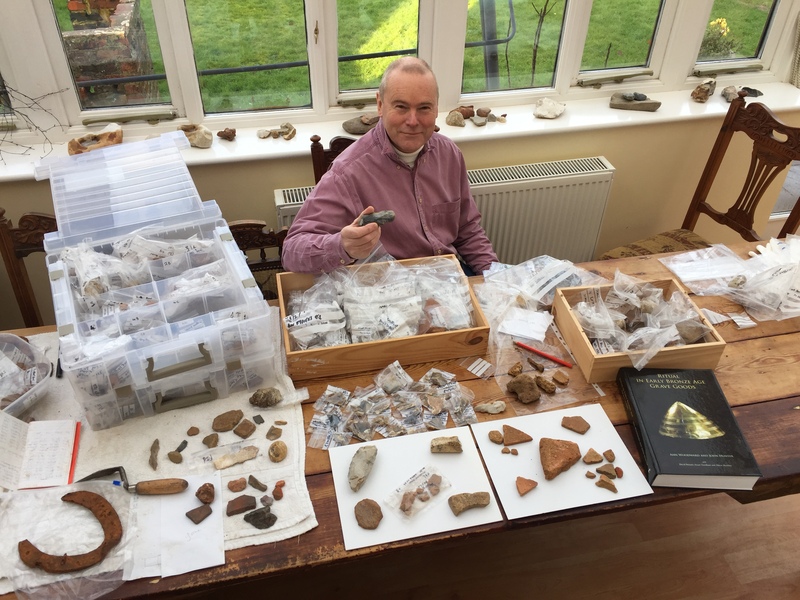 In July 2015 Chris Healey, an archaeologist, and his (long suffering and budding archaeologist) wife Pauline, found some bits of pottery in a field after some agricultural works took place. At this time we are keeping the location confidential as ‘Night Hawking’ is a serious problem, where treasure hunters raid and steal from interesting sites at night and sell items they find. So if you do know where the field is please do not make this common knowledge. All finds belong to the landowner, and this is the only person who can give permission to explore the field. The initial finds have led to some organised field walking, a drone survey and support from Hampshire based organisations and to date well over 200 items have been found. 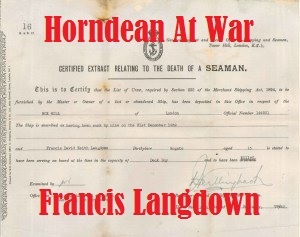 Between them they give some clues as to how our early ancestors, perhaps 400 generations ago, lived in Horndean. Chris, Pauline and their helpers including professional archaeologists, have found over two hundred items including sections of pottery, flint tools and bone. It is possible there were early settlements in the fields, but credible evidence has yet to be found. There is evidence of there having been fire, but the nature of which, domestic, industrial (pottery or metal working) or even ritual, has yet to be discovered. Oyster shells have been found on the ground – interesting as we are some 10 miles inland. All of these are signs of habitation. As well as a source of food (a great favourite of the Romans and possibly suggesting trade) they were used as inclusions in pottery and also in the production of lime in later times. Archaeologists have divided the human past into different ages, as can be seen below. These ages are not universal over the globe, as people progressed through them at different times in different places. As an island and somewhat isolated at the edge of the continent, from Mesolithic times Britain was behind the continent in its progression through them. The Mesolithic Age (Middle Stone Age) was inhabited by hunter gatherers. Stones were shaped into tools and it is known they were skilful woodworkers. Lightweight structures made from wood and animal skins provided shelters. These would have been very easy to dismantle and transport to another location as seasons changed. Different foods were available in different places ,and shelter from weather was needed. Lighter items would have been carried to the next place while heavier ones would have been stashed until their return. The field has shown signs of usage but no evidence of a as dwelling yet. A dwelling would have had a hearth, and are rarely found as they are ephemeral. Two have been found near here, last year at the Heath in Petersfield, and about 10 years ago under the sea at Bouldner Cliff on the Isle of Whight. Evidence may be gathered at a later date using techniques you see on “Time Team”, but ploughing may well have already destroyed what there was. Life in the Mesolithic age was tough. This really was people scraping a living; Mesolithic man tended to die young and longer life expectancy was 30 to 35 years, perhaps 40 at a push. Clothing was fur and leather with moccasins or nothing for footwear. Wooden or woven bowls (long since rotted away) would have been used to collect and eat berries and nuts, particularly hazel nuts, which were a staple. As skilled carpenters and weavers of grasses etc they were able to fashion most items needed in life. Pottery was rare in these times. There is growing evidence of communal organisation, but not yet of an obvious élite. In the last 200 years of the Neolithic, now increasingly known as the Chalcolithic, copper began to make an appearance as items of prestige. The Bronze Age saw the introduction of tin in an alloy with copper to fashion bronze tools and items of status. By this time herding of animals was well organised and the hunting of wild animals greatly reduced. Agriculture was widely adopted, and woodland certainly coppiced in many places. Of course wild animals such as bears and wolves were common. There is much evidence of transhumance, from the continent and throughout Britain, including Scotland. Bronze was common and there was an increase in the use of gold as either trade or more often as indications of prestige and status. Fields started to be formed with well defined boundaries, some can still be seen on Dartmoor. Recent research indicates the gold had a west country source. Sadly there is to date nothing to confidently say we have found as yet any Bronze Age habitation in Horndean, but hopefully it is only a matter of time. We are surrounded by Bronze Age barrows, so we know it was populated. We are hoping some pottery may turn out to represent this exciting and important period of prehistory. Many field systems identifiable today were organised in the Iron age, and can be seen on Butser. Some of those boundaries still exist as boundaries today, and it may be later we may identify them here in Horndean with some confidence. Iron Age pottery has been found in Horndean, and in Catherington Lane close to Victory Avenue, a coin of the local Belgae tribe was found some 30 years ago. The coin was minted about 50 BC, 100 years before the Roman invasion. The Belgae tribe arrived in the late 2nd or early 1st century BC and occupied an area roughly defined by the Hampshire basin, making their capital at Winchester. 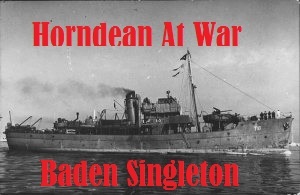 Horndean was the eastern edge of their domain. Initially the Roman occupation made little impact in many southern areas, but typically established farmsteads were abandoned at the end of the 1st century AD with redistribution of land with villa complexes by the Romans as they reorganised the country. One such villa may well have been in the Queen Elizabeth Country Park. We also hope that a proportion of the recently found pottery will be identified as coming from this early pre Roman and Roman period, along with some ceramic building material (tiles and brick fragments) and nails. It is probably not commonly recognised, but the Romans were also of the Iron Age, an age which sociologists consider ended as recently as the 1970s when we entered the Silicon Age. It is likely in the south of England the Roman invasion was relatively seamless, with the mantle of Rome being taken up by the local social climbing élite. Roman kilns which could be the source of the pottery were active in Rowlands Castle, and further afield at Alice Holt and Portchester. We will hopefully know the answer to the question in the not too distant future. Pottery probably from the Saxon period (Early Medieval), which took over from the Romans around 450 AD , has also been found, again we are awaiting confirmation of its origins. As mentioned earlier, building material in the form of tiles have been found in the field, as well as in gardens along Catherington Lane. An obvious question is, “Does this mean there have been buildings or settlements in the field?” Disappointingly there is no guarantee, one of the ways in which pottery finds its way into fields is in their manuring, where animal yards were cleared out and the contents spread across land. 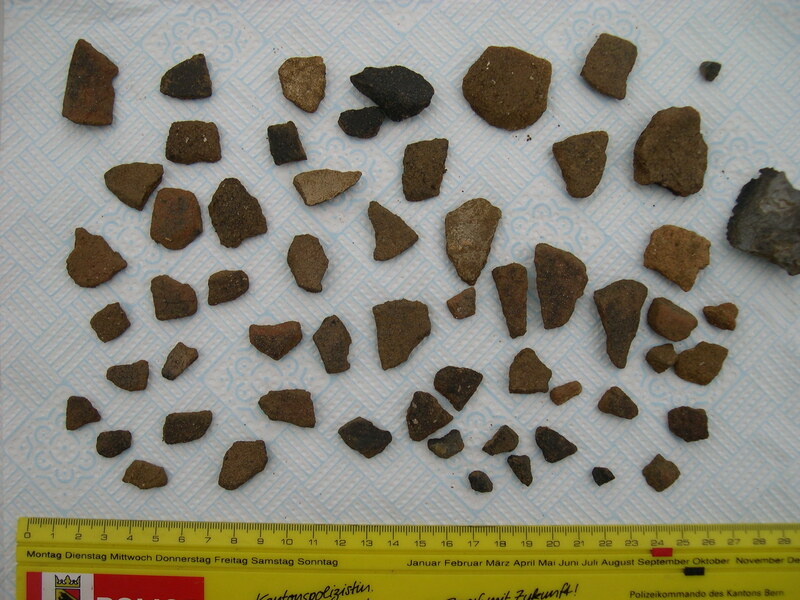 Later medieval pottery has also been found. Pottery can be identified by experts looking at it through a microscope. At different times people added different inclusions in their clay, for both social and practical reasons. They include broken and crushed pot, crushed shell, crushed flint both burnt and unburnt, sand and chaff. Colours also vary, black is often Iron Age; grey either Roman or Saxon; red many periods, but colour is only an indication. In the same way quality varies dramatically from fine to extremely rough, hand made or wheel thrown. Most of the pottery is badly abraded, meaning it has been moved a lot in the soil, and worn by weather. There are few large shards. One of the common finds has been “pot boilers”. They are stones which were heated in a fire, and then placed in pots or pits to cook food. When they were so used we cannot say. There has also been amount iron pyrites, often found in clay. However slag has also been found, which may indicate iron working somewhere in the area. What do you call treasure? As archaeologists knowledge is treasure, and the clues so far uncovered are the beginnings of treasure. Certainly the tranchet axes alone are wonderful; only 4 have been found in Horndean and the surrounding parishes in the last 150 years, and we have 3 in as many days! As for monetary value, there is little hope of a treasure trove. 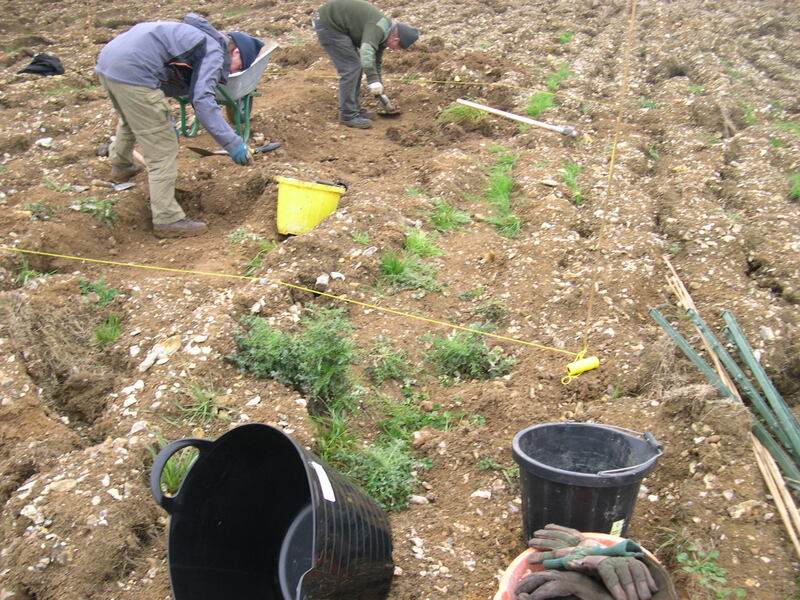 The field was searched some years ago by a detectorist, but reportedly found nothing. It is important to preserve the archaeology in-situ as it is only by knowing where it is found and in what context can an accurate interpretation be made. Random investigations muddy the already challenging target of discovering more of our fascinating heritage: we are lucky to live somewhere we can learn so much about. We are reminded the land is privately owned, the current investigations are with the permission of the land owner and any other searching or metal detecting is trespass and illegal, as is the removal of any artefacts. Over the coming months Chris and Pauline hope with the support of Cllr Schillemore to plan in further investigation and you can help with this if you are interested! The next step is to work out how the field was used through the ages as different settlements came and went. This will include field walking, some local excavation and geophysical investigation. Geophysical Investigation: As land is used it is disturbed. Two methods can identify these changes without physically disturbing the lands further, magnetometry and resistivity. We plan to use magnetometry which is quicker and easier to use. This will enable targeted excavations should it be seen to be necessary to help understand the land. Desk Based Research: This is actually an important first step. Old tithe maps, OS maps and historical documentation are valuable resources. aerial photography from the early days of flying have been archived, and will be seen. Photographs from our locality will help. All of the artefacts will go to a museum for archiving or display. As a collection from one area they can give a very useful picture of the area for researchers to look at how the area was used over the 10 millennia. As has been mentioned earlier pottery was found at the site of the new vicarage. Can anyone remember this happening or were you there? Equally, do you have items you have found in our area which have not been seen and identified by experts? Finds are retained by the finder, and thus cannot be taken from you, do not be shy! Finds help us to learn about our past, basically without them we will learn little. If we do not know what the finds are, there are experts around. The South Down Group have organised a presentation on The Secret Wildlife South of Butser at St Wilfrid’s Church Hall in Cowplain on the 17th February. Details Below!